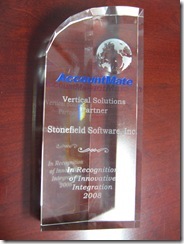 At the 2008 AccountMate Synergy conference earlier this month, Stonefield Query won the Vertical Solution Partner Award for Innovative Integration. 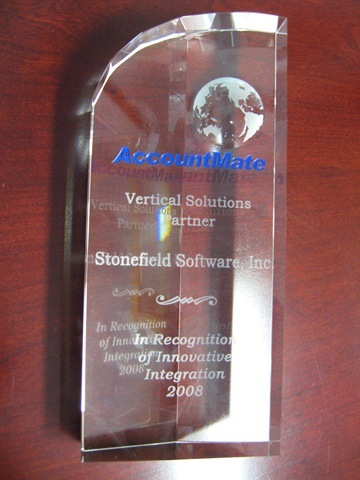 We are honored to receive this award and thank AccountMate Corp. for being an outstanding business partner. I came across a cool little free utility today: Pixie. It does only one very simple thing: it shows the color of the pixel under the mouse in various measurement systems: HTML, RGB, hex, CYMK, and HSV. This is really useful if you're designing a Web site or an image and want to use the same color as an existing image. In the image below, the mouse pointer isn't shown, but it's over the orange part of the Blogger icon in the "Weblog" box at the right. The FoxRockx Web site is now open for business. You can check out the contents of the first issue and subscribe. In addition to the magazine, subscribers get full online access to past issues of FoxTalk, including source code, back to 1996. Craig Boyd blogged about the Sedna installer not handling the VFP DDEX provider properly. This weekend, Rick Schummer found an issue while testing my chapter for our upcoming Sedna and VFP 9 SP2 book: he got a “Type Library VISTADIALOGS4COM.TASKDIALOG not found” error when running some code using Vista dialog event handlers that come with Sedna. Interestingly, it worked on my laptop but gave the same error running on my home desktop system. Digging into this, I found that I had an earlier Sedna CTP on my laptop and the release version on my desktop. My laptop had a type library for the Vista dialogs, VistaDialogs4COM.tlb but my desktop didn't. I figured it was a registration issue, so I ran RegAsm (the .NET utility that registers a .NET DLL as a COM object) with /TLB as a parameter so it would generate a type library. That didn't work, so I ran RegAsm with /U to unregister and then RegAsm with /CodeBase and /TLB, and that worked. So, obviously the Sedna installer is missing /TLB from the RegAsm command line call. In case anyone else wants to take care of this, here's the contents of a BAT file you can use. Change the paths as necessary and use Run as Administrator. The premier VFP conference in North America, Southwest Fox, will take place October 16-19 in Mesa, Arizona. We're now looking for speakers. If you're interested, please check out the Call for Speakers link at http://www.swfox.net/callforspeakers.aspx. Proposals are due by March 17. The first issue of FoxRockx, a new bimonthly magazine published by MVP Rainer Becker, is almost ready for release. The first issue has an introduction to VFPX by Rick Schummer, a Kitbox article from Andy Kramek and Marcia Akins, a how to-article from Tamar Granor, and part one of a two-part article presenting generic import classes by me. If you're a current FoxTalk subscriber, the remainder of your subscription will automatically be honored as a FoxRockx subscription, as Rainer has taken over FoxTalk from Eli Journals. Something is also being done for Advisor Guide to Visual FoxPro subscribers, although I don't have details. For everyone else, subscriptions are inexpensive: $99 US/99 euros for online-only or $138 US/128 euros for online and printed copy. Subscriptions in North America will be available from Hentzenwerke Publishing. The Web site isn't quite ready yet but they're working on it. In addition to the magazine, another benefit is online access to past issues, including source code, of FoxTalk. As far as I'm concerned, that's worth the subscription price alone! Please support this new magazine by subscribing as soon as subscriptions are available. This is the only magazine devoted exclusively to VFP, and like VFP conferences, this falls into a "use or lose it" category. The My Registration Editor form had a typo in the tooltip for one of the edit boxes and the wrong tooltip for another. Also, it didn't find an existing record in the My table for a non-My class, so it acted like the class was being registered for the first time. The MyFoxCode class, the main IntelliSense class for My, would locate and use deleted records in the My table rather than the current ones. I've posted an updated version on the Technical Papers page of one of my Web sites, www.stonefield.com.